Modern enterprises are rapidly shifting core business processes away from legacy technologies and standardizing on mobile devices and cloud services. As a result, these organizations are quickly outgrowing basic mobile device management (MDM)capabilities and apps like email and calendar. 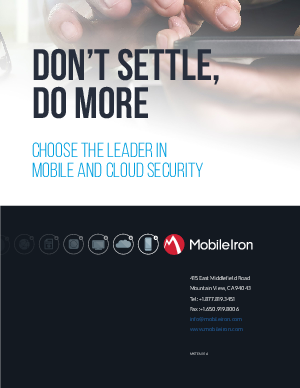 Building a secure mobile and cloud architecture now requires a comprehensive approach to enterprise mobility management (EMM). It requires a unified platform with defense-grade security, massive scalability, a broad ecosystem of technology partners, enhanced Office 365 security, and integrated desktop and mobile management. And it has to provide all of this without locking customers into a proprietary technology stack.